What Size Corrugated Signs Do You Need? 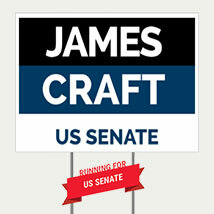 Put a spark in your campaign by getting the most out of your signage- with more signage! 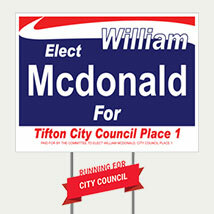 When you purchase 10 signs, we’ll throw in 1 extra for free. What exactly does that mean? 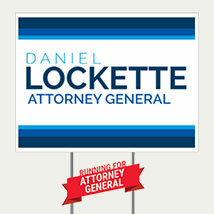 When you buy 100 signs we only charge you for 90! The other 10 are on us. Just as a small thank you for supporting our business! 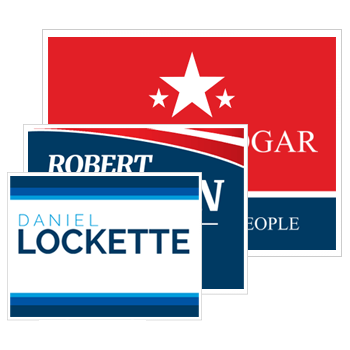 What is the most common size for political yard signs? 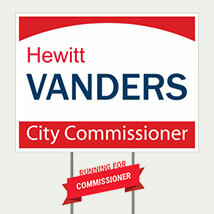 By far, the most common sizes for campaign signs are 18”H x 24”W, 24”H x 36”W, 48”H x 48”W and 48”H x 96”W. 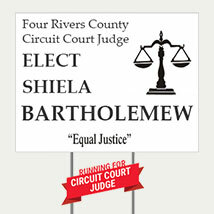 Besides my name and position, what else needs to be on the sign? 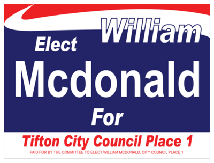 The name and elected position are all that you really need. 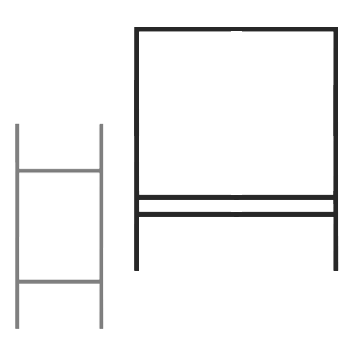 A simple graphic can help grab attention, but you want to keep the overall design simple. 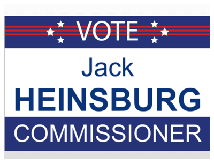 Any other important information can be added to a palm card to hand out to voters. Does my sign need a disclaimer on the bottom? Most states to require some sort of disclaimer and each state requires different information. 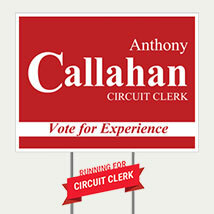 Please contact your local election board for your state laws. 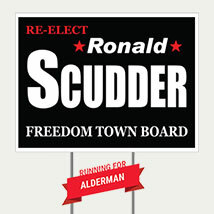 How do campaign signs work? 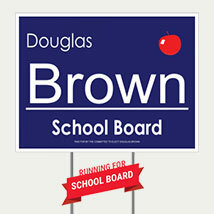 Seeing your signs on a daily basis will make voters remember your name and think of you on polling day. 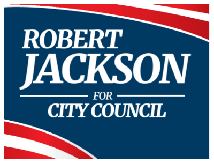 These signs can cause voters to seek out more information on candidates or be the sole reason that uninformed voters vote for you. Corrugated plastic signs have vertical flutes running through the middle. To install the stake, simply insert the H frame into the flutes and use the bottom of the H to step the stake into the ground. 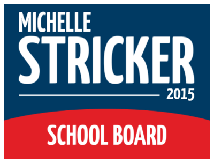 Where do I put my campaign signs? Start with your very own front lawn. 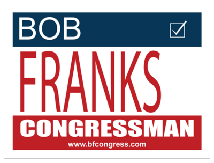 Hand out signs to your friends and family and give them a few to hand out. 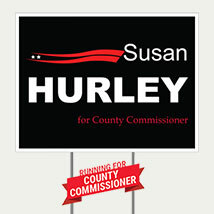 Ask your committee members and volunteers to take a sign or two as well. 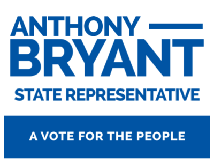 Additionally you want to target high traffic intersections and knock on the doors of voters that live on busy streets and keep a list of all of the people that allow you to place signs to contact next time as well. Does the sign price include the frame? No, the stake will need to be purchased separately. Click here to check out our stakes. 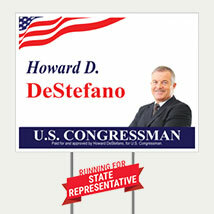 - Design & order custom political yard signs online FAST & EASY! - Fast turnaround with even same day shipping options! - Wide selection of coordinating products such as banners, magnets bumper stickers and more. 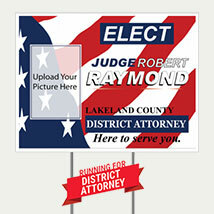 - Huge selection of election sign templates that can be customized by you! - Quantity or volume discounts. Production Method: Digitally Printed or Screen Printing (method depends on colors and quantity ordered). Finishing Options: Single or Double sided print. Full bleed or white reveal. 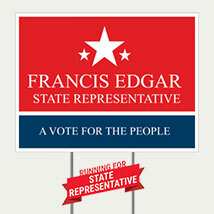 If you are looking for political yard signs for your election campaign, you have come to the right place. 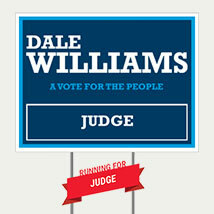 SpeedySignsUSA has hundreds of election sign templates that can be customized to fit your needs. Change the name, office, colors, or even upload your very own design. Don’t have a logo yet? Connect with our fantastic customer service team to have a unique FREE LOGO designed just for you! 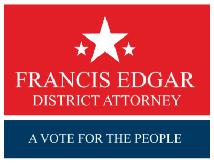 We are here to help you get elected! 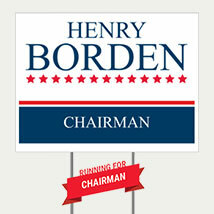 Political Yard signs are a quick and affordable addition to your campaign needs. 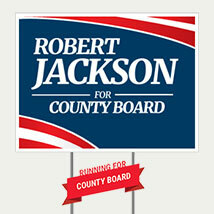 Our signs can be used to promote you as a candidate as well as spread the word about your platform views and ideas. 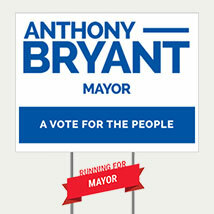 At SpeedySignsUSA we offer fully customizable signs. We print our signs on high quality corrugated plastic to ensure that you are getting the best product available. The ordering process is simple, just start with one of our pre-designed templates and customize it to your needs, or create your own design from scratch. 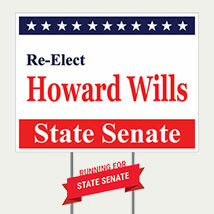 Political yard signs are a tried and proven medium for gaining awareness for your campaign. 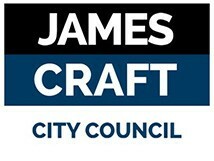 Getting your name out in front of the public is very instrumental in winning an election. 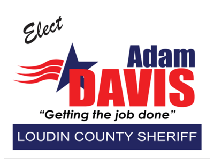 Often seen on every corner during election season, it is important to create a political yard sign that stands out from the crowd. 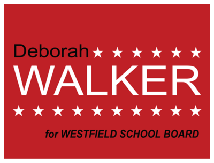 Using color is a great option for this, check out our election sign templates for ideas, but feel free to contact us to create a sign that is as unique as you. We specialize in adding photos or even cutting signs to shape for additional attention getting options! SpeedySignsUSA proudly uses only corrugated plastic (coroplast) that has been manufactured in the United States. We use a premium grade that is whiter, and more opaque to prevent images showing through on double sided signs. 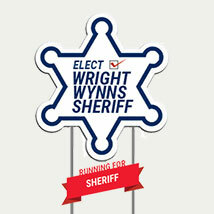 Printed with state of the art flatbed digital printers, our signs will hold up outdoors in rain or sun. Because of the large volume of orders we print, we are able to keep our prices extremely low even though we offer premium materials.